This tree often grows to about 10 m tall. Leaves alternate, leaflets 2-4 pairs, a small spine is present at the end of the rachis. Leaflets are up to 18 cm long and 5 cm wide, margins are smooth or may have a few widely scattered teeth; domatia are absent. Inflorescence is a panicle up to 7.5 cm long. Petals are white. 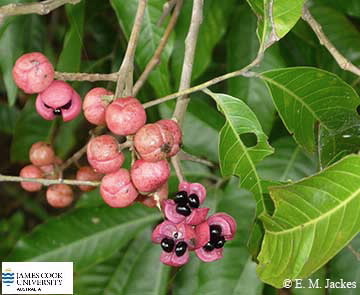 Fruit is a globular capsule to about 1 cm diameter, dark pink, valves 3 opening to reveal 3 black seeds with a small purplish 2-lobed aril at the base of each seed.